Since its foundation in the 70’s Nordimpianti has been driven by the desire to build and supply products of the highest quality and always using the latest technology available. Nordimpianti has a wealth of experience gained from working all over the world and makes us a reliable partner to supply efficient production solutions. The company started as a Slipformer machinery producer for inverted T beam, hollow core slab and vineyard post production for the Italian market. The experience that they gained allowed them to mature as a company. The 1980’s saw the opening of an sales office in Milan with the aim to expand the business not only in Italy but also in neighbouring countries. NORDIMPIANTI become the first company to develop a Slipformer for the production of large hollow core slabs and inverted double T beams up to 700 mm high. To this day NORDIMPIANTI is the only company able to produce such a Slipformer. The name of the company changed to NORDIMPIANTI OTM SRL with a production plant in the city of Sambuceto and the sales office in the north of Italy. (Hence the name NORDIMPIANTI, literally NORTH PLANT in English). 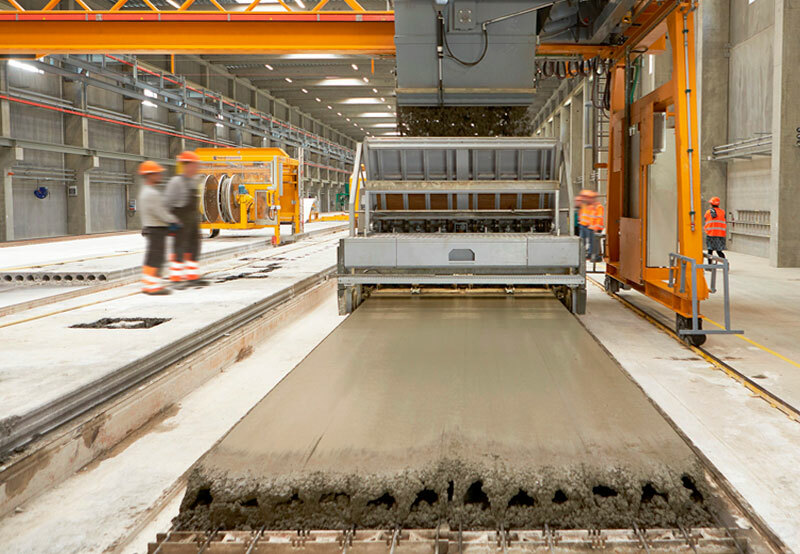 NORDIMPIANTI developed the first Slipformer machine for the production of wall panels with exposed colored aggregates for an important company in Belgium. In 1995 saw the implementation of the carousel production line concept applied to a manufacturing plant, unique in its class, for the production of inverted T beams. The plant produces up to 27 000 m of inverted T beams per day with the minimum of personnel. In 1996 also underlined the technical credentials of the company with the development of an Extruder machine for the production of hollow core slabs up to 500 mm high. The availability of this well known technology meant that the company could respond further to meet market demand. In 1997 the company became NORDIMPIANTI SYSTEM SRL. where the title “SYSTEM” reflected the fact that the company now offered a complete service in all aspects of the production chain using its experience gained in Italy and overseas. It still has this name today although because of its familiarity in the market place it is referred to, more often than not, as NORDIMPIANTI. NORDIMPIANTI adds to the capabilities of the Slipformer by developing a machine able to produce hollow core slabs 1 m high and up to 25 m long. Extruder technolgy is enhanced to produce hollow core slabs with widths of 2.4 m (or 2 elements each 1.2 m wide) up to 500 mm high. A second carousel plant, this time for hollow core slab production is commissioned. The plant can produce 3600 m2 of product a day. In the same year, responding to increased market growth and the desire of NORDIMPIANTI to further improve its spares and after sales service, the company moved into a brand new production and office facility. The new factory put all the manufacturing, administration, spares and after sales service departments under one roof. NORDIMPIANTI took advantage of a new opportunity manufacturing the first Extruder in the market capable of producing hollow core slabs of 1500 mm wide for the Russian market. The new plant was a complete factory project in the Russian city of Tyumen. There was a further enhancement to the Extruder in 2009 with the manufacture of a machine for the production of hollow core slabs for the Belgium market. The machine can produce 2 hollow core slabs 600 mm wide at the same time or, by using another forming insert a single standard 1200 mm slab. The new EVO Extruder series was unveiled during the BAUMA exhibition in Germany. The Extruder range was expanded once again, this time to meet the needs of the Brazilian market to be able to produce Hollow Core slabs in widths of 1250 mm. The new model was designated e125 and joins the existing range of EVO e60, e120, e150 and e240. The range of casting machines from Nordimpianti has been expanded and updated and now includes the new WF Wet Casting machine. Nordimpianti is able to provide all three casting systems for the production of prestressed elements, Wet Casting, Extruder and Slipformer. The new EVO 2 Extruder series was unveiled during the BAUMA exhibition in Germany. Nordimpianti brings to the market the new NANO Extruder machine for the production of non-loading partition wall panels. This machine is able to produce 2 wall panels 600 mm wide simultaneously and in heights from 80 mm to 120 mm high. Presentation of unique precast floor elements for road and infrastructure applications.